Last night, I posted a request that you switch from your Feedburner-sent newsletter of my blog. It turns out that you may have been getting the posts through Google also. Posts look horrible in both, and they both add ads that I can't control, which are sometimes inappropriate. So, here's what I'd like you to do: Look at the bottom of this newsletter. If the very last line says that it's powered by Google or Feedblitz, please unsubscribe by clicking on the appropriate link. Then, go to mnav.com and put your email in the form in the upper right sidebar, and click the button. This whole thing should take about 15 seconds. Thanks. I'm switching off to a Newsletter-Centric rather than a Blog-Centric format. The difference is that blog posts are either read by newsreader software or by an automatic newsletter format such as Feedburner. If you don't know what RSS is, you are probably reading this either on the blog directly or in an automatically generated format from Feedburner. This restricts my ability to send my subscribers special insider information that I don't want to post generally on my blog, such as giving them access to various ebooks that I don't want to give away to the general public. Take my word for it, you want to fill out the form below, especially if you haven't received my Special Report, "The 10 Simple Yeses to More Sales Faster." Please do it now before you forget. If you get duplicates, unscribe from the Feedburner newsletter. It will say "Feedburner" at the bottom. If you are not sure, enter your email address in the form and click the button. If you are already subscribed, it will tell you so. If not, you will be. Enjoy. In the wake of my Delta incident, I've been asked by some readers for specific directions about how to complain on Twitter in a way that will get results. It's very simple: Just mention the company with an "@" sign in front of it. Or, do a search on Twitter to find out the Twitter account name they use, and put an @ sign in front if it. In the Case of Delta, I didn't bother to look up what they used, and just used @Delta. It turns out that they use @Deltaassist, but they picked up on it quickly. As I mentioned in my previous post, don't come from anger. Come from service to the company and your fellow followers. That said, ridicule, sarcasm and satire are fine, particularly if you can be funny. Here is a list of the Tweets that I used, In reverse chronological order (Recent --> older). Read them from the bottom up. Below are the complete public messages, omitting a few minor Direct (private) Messages that gave them the details of my Confirmation Number and the flights I wanted. Note: to send them a private message, once the company responds to you, you have to "follow" them, then click "Messages" and you can then send them a private message. Note how absurdly simple the whole dialogue was. But, it saved me $1200 ($150 change fee, $450 in fare adjustments times 2), plus several days of awaiting and sitting in a hurricane. I hope this helps you get out of — or stay out of trouble — in the future. P.S., our house is fine. Thanks to those who asked. "Doug Dole" a sup @Delta says the hurricane will not hit NYC, so he won't change my ticket w/o $450 per tkt fees! DON"T FLY Delta! @Delta won't change my tkt from a Sun flight from NYC w/o charging $300+ per ticket because NYC isn't on the hurricane list! The Wednesday before the Hurricane Irene was to hit NYC, all models showed that it would pass over JFK airport Sunday Morning. I had a flight due to leave at 9AM on Sunday! So, I called Delta and explained that in view of the almost certainty of the hurricane hitting, I'd like to change my flight to two days earlier, and I'd like to do that now, so that I could save myself and Delta from at least one more call before they got swamped with hurricane rebookings. Spoke to a "Doug Dole" a supervisor at their reservation center, after the request was rejected by a regular agent. He informed me that NYC was not on the list from which they could issue re-bookings. Only Charlotte was listed (at that time only about an hour away from the hurricane's impact.) I politely pointed out that that was cutting it a bit close and that I'd appreciate his accommodating me, given the inevitable crunch. He informed me that the hurricane was due to veer off and not hit NYC. He said that a change would involve a $150 re-booking fee and a $450 fare increase, since it would be a cancellation and re-booking on short notice. I called back to another supervisor, who said that she would waive the re-booking fee, but not the fare increase. As you probably guessed from the Twitter reference above, I got to work with several posts on Twitter, openly ridiculing Delta's weather forecasting (which I guessed was being done by Ouija Board). I pointed out that their weather update was from 6 o'clock the previous day -- an eternity when a hurricane is approaching. I quoted "Doug Dole," their Utah supervisor, as forecasting that the hurricane was not going to hit NYC. As I was composing a satirical post, about a half hour from my first Tweet, talking about how they were getting their updates via carrier pigeon, I got a reply from Delta. Their DeltaAssist people publicly tweeted that I should Direct Message my confirmation number and the flight I'd like to transfer to. Don't write private complaint letters. Use Twitter and the other public complaint and rating services to publicly flag companies that are not treating customers right. These will differ according to the circumstances. Although I can't prove it, my experience is that humor, ridicule and particularly satire works better than angry rants. See my Word of Mouth book for examples. Come from trying to help them do better, rather than from anger. It's also about doing what Delta obviously does: it has a team that monitors the social media sites and has the power to cut off a very negative backlash before it got started. Believe me, I know how to use word of mouth. If they had let this go unresolved, I could have created a major, very damaging campaign, boycott, or other negative consequences that could have cost them millions of dollars, as I sat here instead of LA because of a cancelled flight. Treat people right. Monitor their complaints, if for no other reason than you don't know who you are dealing with. There are better reasons to treat people right, but for people who only look at numbers, this will do. Why can't companies like Delta do what it takes -- like greater discretion, more aggressive forecasts, etc. -- to handle situations like this? Why do we need to resort to public humiliation to get treated like valued customers? I know what they would say, and so do you, so I'll spare you. However, the fact is that they DID treat me right, so they could have done so in my first phone call. BTW, JetBlue and Virgin were honoring re-booking requests at that time without a problem. So, Delta missed a chance with an influential blogger to make me feel good about them, instead of confirming all the talk about them being unresponsive. The fact that they eventually did the right thing doesn't change my opinion, since they did it under the threat of further public humiliation. JetBlue and Virgin got kicked up another notch, even though I wasn't even booked on them! Despite the good outcome, I will not be booking on Delta in the future if I can help it. By the way, in the current issue of its in-flight magazine, their president is calling for government subsidies for the airlines. He needs subsidies, given the way he seems to run his airline. Maybe I'm wrong, but I haven't heard SouthWest, JetBlue and Virgin asking for government subsidies. Let's all look at how we are treating customers -- even those who might be making borderline unreasonable requests. But especially those who are sitting under hurricane projection models that are clustered more tightly than ever remembered by experienced meteorologists. Delta, if you have to have an obsessive, rigid rule, why not make it OK to switch flights the moment NOAA predicts that there is a greater than 50% chance of a hurricane hitting? Is that too much to ask? In your in-flight magazine, you are actively soliciting suggestions. Let's see how you respond to this. Awaiting their comments below. Blah, blah, blah. Sounds great, but it's completely useless. It's almost the general definition of Business. Marketing is not something you do to customers, it's something you do for customers. It's the service of making the right decisions easier for the customer. This statement has been floating around the Internet for years. It's my most quoted statement. I'm delighted, because it goes right to the core: make the right decision easy. Because easy means faster and that's really the hidden secret behind marketing success. If you can get customers to make decisions faster for your product than the competitor's products, then you accumulate customers faster, even without greater brand choice. But “faster” isn't the primary thing to focus on. When people focus on getting the customer to act faster, they end up pushing or pulling the customer, creating resistance, and prolonging the decision cycle. It's sort of what happens when people focus directly on making money as the primary goal, rather than creating value. Money is a consequence of value creation, in fact, it's the primary way that value is stored. Focus on money first, and weird things happen. Focus on value, and magical things happen. In the same way, focus on making customer decisions easier and simpler every step of the way, and sales accelerate automatically. People are overloaded, with dozens of New Media. They don't have time to deliberate. They are swamped. They don't have time to sort through the flood of information. You provide the service of saving people from the time and burden of deliberation. Helps the customer find you more easily. In fact, marketing in good companies is part of product development in most good companies. The product wouldn't even exist if it weren't for marketing. Helps the customer learn, use, fix and teach the product. Only a few companies have discovered that customer service isn't a cost center, it's a marketing center. Companies like Amazon, Zappo's, Apple. So, it isn't just about getting people to buy. It's about smoothing the way, every step of the way. You want to focus on making the series of potentially difficult decisions easy, simple, fun, smooth, effortless for the customer. And not just up to the moment of purchase. Throughout the life of the product, indeed, throughout your entire relationship with the customer. If you're doing the right thing, they will trust you. And trust is very practical. It makes the decisions very easy and fast. For instance, Google and Apple make my decisions easy and, therefore, fast. They can be counted on to get it as close to right the first time, then rapidly improve by listening. The main goal of a business is to provide the best product for a given situation. The main goal of marketing is to get people to see that it is the right choice, given the circumstances. In some circumstances, your product itself, in the abstract, isn't the best product, or isn't any better than any other product. But if you make the decisions easy, that is, make it easy to get and weigh information, to try, to use, to deal with you, to tell the people about it, your product then becomes the better product because, even if it's equivalent in physical characteristics, it's easier to find, understand, try, learn to use, fix, explain to others, etc. That's better, even if the physical product is identical to the competitions'. Conventional marketing focuses on persuasion: to make the case better that yours is the more desirable product. That's good. But there's a better way. I call it Decision Easification —- because there's no word on English for "to make things easier." "Facilitation" doesn't quite do it. So, they (1) stumble enough, (2) turn around and go home or (3) find another product that's easier to fathom. Example: Take the switch from Windows to Mac. For years, Apple didn’t get how hard the switch is. Yes, OS X is a simpler, more intuitive way of doing things. But while it’s simpler and easier, it’s different. So, at every difference point, learning or thinking has to happen. That slows people down, disorients them, breaks their flow, and makes them feel frustrated or stupid. Every Windows user knows they will have to go through this, so it’s a gigantic bump on the decision road, up the Culling, Trial and Learning hills. While Apple has made tremendous strides in easing the transition, they are still not there yet. They should have a Windows Transition Mode on their OS and their programs, and run Windows natively on OS X. The point is that Apple can be persuasive and convince people they have an easy-to-use operating system: but they haven't eased the anticipated and actual transition enough. So, the hidden obstacle is: anticipated transition difficulty. Ease that and sales will multiply. I just noticed something interesting. A lot of people come to this site after having Googled the phrase "Marketing Questions." So, I looked up the phrase on Google Trends. I've just revised my bio. It was pedantic and academic, and didn't give a picture of what I'm all about. So, I revised it. Here's the problem, I have Expert Blindness on this subject. While I think I've trained myself over the years to have less expert blindness than most, this one's about the product I'm most expert about, close to and nonobjective about: ME. I don't have a clue if this gives a picture of me in a good way, or if it's off track. I've tried to reveal who and what I'm about in a way that facilitates decisions about whether to work with me as a marketing consultant. But I look at it and I don't have a clue. I think you'll find it interesting, since it summarizes some marketing principles about as succinctly as I've ever done. I'd sure appreciate your frank feedback. Particularly, what was helpful in getting to know me? What gave you pause, raised questions, stimulated qualms, or in any way put you off. Don't worry about being insulting or trying to be tactful. The main criteria you should use is, "Does this make it easier to get a 1-1.5 hour telephone marketing consultation with George Silverman?" What would make it easier? I'm posting this as a blog post, so that the people who subscribe via email to get my blog posts will see it. Its actual home is the About page on the menu at the top of the pages on my web site. Secret 1: Product appeal: Atlas Shrugged Part 1 didn’t try to be everything to everybody. It was independently produced. While this is not always desirable, I suspect that, in this case, it allowed for something that is essential: it didn’t have to compromise and please everybody, especially people in larger studios who tend to search for “broad appeal,” trying to please everybody. The secret here is that you have to be something definite, unusual, special even if it turns off large segments of people. In fact, the product which gets people to love it passionately and hate it passionately will win — not the product that everyone likes but doesn’t love. If you market by eliminating objections, you’re sunk. I’m sure there are contrary examples, but I haven’t found one. Take a stand. Make your product definite, flaunt its shortcomings and brag about why it’s unusual and special. He who tries to be everything to everybody is nothing to anybody. Secret 2: You don’t have to spend a lot of money, if you’ve got the goods. A certain austerity ($10 Million for a film is minuscule) probably helped the production values. I don’t know; I’m not a film expert. But in marketing, I know. They had virtually no marketing budget. This forced them to think. They used a word-of-mouth campaign that you can read about here: Hollywood Reporter Article The most important secrets are to go to the people who can spread the word. In this case, certain commentators, Tea Party groups, other pro-Objectivist groups and allied groups, such as Libertarian and Conservative groups. I would also go to pro-business groups, since this is the first businessperson-as-hero movie in a long time. So the secret is: leverage your budget and other resources by getting other people to sell your product. Go to the people who would like to see your product succeed. If there are no such people, either you are overlooking them or you need to further develop your product to be one that a small segment of people will RAVE about. THEN, find those people. Or, you can try advertising, but you’re probably wasting your money. Put it in R&D. Secret 3: Atlas Shrugged was a movie that Ayn Rand admirers have been hoping for, for over 45 years. It’s easier to find high-pent-up-demand products than you think. Secret 4: Take advantage of spin-off products. People want to have T-Shirts, bumper stickers, mugs, etc. Accommodate them. Secret 5 & 6: Certainly this was unintentional, but they were forced into scarcity marketing. The movie was only available in 299 theaters around the country (normal is 3000), frustrating large numbers of people, which made them want it more and made them willing to take action. The producers harnessed this frustration through a web site that encouraged people to pressure theater owners to run the film. But they didn’t have enough prints, increasing the desire. The next weekend (the Easter weekend) they were in about 450 theaters. Projections are they will be at a thousand in a week or two. So, scarcity marketing can help (Secret 5), and don’t neglect turning your customers into salespeople not only to their friends but to more leveraged people such as retailers, distributors and, in this case, theater owners (Secret 6). Secret 8: Teasers. Atlas is a mammoth book. So, they broke it into three parts, each coming out on Tax Day, April 15th. Now, they can take advantage of the anticipation for two more years. Secret 7: What’s the product? While it may seem obvious that the product is the movie, it isn’t that simple. In book form, Atlas Shrugged sold about 150,000 copies per year until recently, making it an all-time continual best-seller. However, since Obama was elected, it has sold more than 600,000 copies. As of this writing, the extra publicity about Ayn Rand, her ideas, her uncanny predictions about present events has kicked it up to about 25 on the Amazon best-seller list, amazing for a 50+ year-old book. So, I think the product is her ideas, made tangible through the book, then the movie coming at a time when it explains so much about our present society that it gets a lot of press about how she predicted what is happening, which increases the sales of the book. Ultimately, it should make Part 2 of the movie, due out next year, much more fundable and a greater success. So, I would say that it’s the brand — call it Ayn Rand’s Ideas, or Objectivism — that is the product. So, the secret is: think deeply about what the real product is. It probably isn’t what you think it is. What you think you’re selling is probably the material form of what you are really selling. 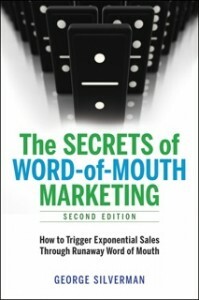 I have a gift for you, the readers of my blog: a free copy of the Second Edition of my book, "The Secrets of Word-of-Mouth Marketing." I've described a little of its history here. It is a broad, systematic approach to word-of-mouth marketing. It approaches WOMM in principle and avoids getting bogged down in all the details of the tools of word-of-mouth marketing. if you don't understand the basic principles, you'll get overwhelmed, fast. That's what's happening in life in general and in marketing in particular. The first person who I just gave a preview copy to just emailed, "This isn't a book about word-of-mouth marketing, it's a book about life." I couldn't have hoped for a higher compliment. You are selling all three. I can't think of a single product, service or idea that doesn't at least imply the other two. You are almost certainly neglecting two of these and and missing some great opportunities. Product: The physical embodiment of what you are selling, how it's manifest in the world, the deliverable, how you know it's there. Idea: The way it's held in the mind of the customer in thoughts and feelings. Try to name a single product/service/idea that doesn't have the other two. You are probably thinking that you have only one of these. Think about the other two that you are neglecting. There, right in front of you, are the opportunities that you are missing. Examples of one that people might think don't have the other two: Pure Product? Candy bar: is the service alleviating hunger, giving a treat, a reward, and indulgence? Is the idea "coconut almond" or "deserved reward" or "guilty pleasure"? Your decision is an opportunity. "Pure commodity" such as gold, steel, soybeans, etc. It's all about the service: payment terms, delivery, support, advice, guarantee of purity, etc. An iPod wasn't mainly a product. We forget that it was an idea: first and foremost it was a way of organizing, storing, sharing and playing your music mess of tapes, CDs, records, files, etc. It was a service that proved that if you make music ridiculously easy to buy, store and organize most people will buy, not steal. Most great "products" are really great implementations of a great idea. Conclusion: there is no pure product. There is no parity, me-too, product. A service and idea is always involved. Pure Service? A psychotherapist: What's the product? Health? Growth? Counseling? Confidence? Feeling of well-being? Greater functionality? Greater emotional health? All or some of the above? What's the "idea"? Remediation or growth. support, fixing, encouraging, greater-self responsibility? Different for each patient? Does the patient know? Is the product delivered in person, by phone, internationally by Skype? Via books, individual sessions, group sessions, speeches, TV talks, a radio call-in program, etc.? Plumber: Is the product fixing problems, new installations, residential, commercial. Is the idea speed, reliability, always showing up, etc.? 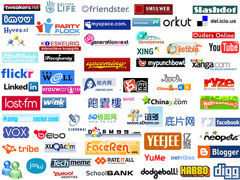 Are Google Search, Amazon, Facebook, Twitter services? Yes. Are they products? Yes. They are at the very least web sites. How you define the product, the idea, (social contact, finding answers, on-demand goods, instant X, easy X, etc. is worth billions of dollars in these cases. They made the right calls at the right time, and implemented their products brilliantly. None was the first.) Conclusion: There is no such thing as a pure service that doesn't have a product and an idea behind it. Pure ideas? What if you are selling the idea of Smaller Government, Lower Taxes, Less Spending? If you are actually trying to "sell" it, i.e., persuade people to agree with you, rather than swirling it around in your head, what's the product, the actions, of your thinking? Joining/starting a Tea Party chapter? Starting a new party? Writing essays, talking, teaching, etc. If you're actively selling your idea, there has to be a product of your efforts. What's the service you will provide? Running for office, teaching, lecturing, public speaking, blogging, etc.? New product idea: You have an idea for a product or service. You're not selling it unless you are taking steps to manifest it (that's the product of your thinking) and you are selectively taking actions in the service of the idea: are you the entrepreneur, the finance person, the inventor, the engineer, some or all of the above? What other services do you need to make the idea into a product? Conclusion: There are "pure" ideas, but not in the marketing context. As soon as you start "selling" the idea, it has to take the form of a product with its attendant services, or a service with its attendant products. Again, think about the areas you might be neglecting and how you can change your assumptions. If you think you might make a million dollars out of these insights, at the very least, you owe me lunch, and a rave in the comments section below.